Boston Comicon was a success on many levels. Not only did we Boston fans get another chance to celebrate and relax after the sad circumstances around the cancellation of the original Comicon date due to the Marathon bombings, but wow, that placed was packed with good stuff. The Ladies were out in force and we were honored to have had the opportunity to meet a lot of amazing women who are out there doing even more amazing things. 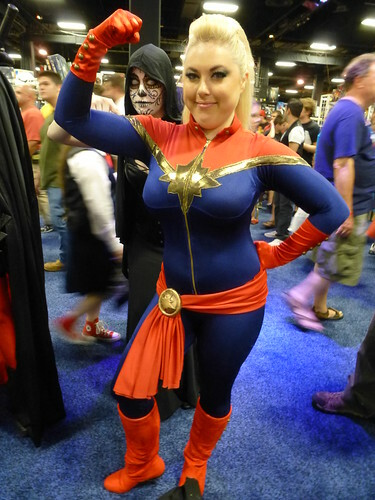 As a little special extra for the blog, I am going to be posting a series of mini-features on some one the truly awe-inspiring cosplaying ladies who are, in my opinion, not only making everyone's Comicon experience richer, but doing their fellow females proud. Cosplay Origins: Bethany worked with a friend who also cosplayed and encouraged her to try it out. 3 years later, Bethany is making her amazing costumes and attending about 10 conventions a year! In addition to Captain Marvel, Bethany also does a lot of video game characters including a female version of Scorpion from Mortal Combat. Favorite Piece: I decided to ask all the ladies I interviewed what piece of their costume was their favorite. Bethany immediately pointed to her gravity defying hair. "This hair is impossible!" she told me. "But I really think I nailed it this time!" A mixture of both her own hair and extensions, I can't even being to think about how time consuming this was. Damn girl! You and your magical hair are amazing! As if we weren't already impressed enough before! Oh, and for those who would like to know who our photo-bombing Death is, that would be Jen-Jen Noodle Bowl. You should "like" her Facebook page too. She is another talented lady we should be looking out for.